Voss Water is a Norwegian brand of bottled water that is the brainchild of two friends who grew up in Oslo, Norway. Those two friends are Ole Christian Sandberg and Christopher Harlem. They came up with the idea of bottling up pure Norwegian artesian water because Norway has a pristine environment and has some of the best springs and artesian water sources in the world. As with the other Norwegians, they believed that it was their benefit to enjoy their pure tasting drinking water and sharing it to other consumers around the world will be a big hit. With that in mind, Sandberg and Harlem came up with an iconic bottle design to match the purity of the Norwegian water and Voss Water was born. Below are the latest Voss Water prices. The cylindrical glass bottle of Voss Water was designed by Neil Kraft. According to Voss, their manufacturing process for the bottle is completely carbon neutral, which means it has zero carbon footprint. Aside from glass bottles, plastic bottles are also used in packaging, but the cylindrical design is retained. It is also worth noting that all Voss Water bottles are also fully recyclable, including their iconic glass bottle. 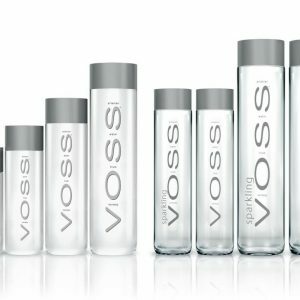 The availability of Voss Water in plastic bottles enabled the brand to reach more consumers because plastic is more convenient compared to glass. There are also places where glass bottles are prohibited, that is why the need for plastic bottles came up. The plastic bottles that Voss uses are free from BPA, which is a compound that are considered toxic to humans. Voss may be a municipality and a traditional district in Norway, but Voss water is not bottled there. It is bottled by Voss of Norway ASA, which is an American Limited Company based in New York City. But, the artesian water comes from Norway, with the water source located in Iveland, a village and a municipality in Aust-Augder county in Southern Norway. From Norway, the two friends’ vision has become a global reality as Voss Water is now available in over fifty countries around the world. Because of its quality and elegance, Voss Water is served in top hotels and in the finest restaurants. It is available in still or sparkling which come in 375 ml and 800 ml bottles. Aside from the luxurious glass bottle, Voss Water is also available in a specially designed and high grade PET bottles, which come in 330 ml, 500 ml, and 850 ml. Consumers can also avail of the multipack, which is the perfect package to take home to the family. Take home packs are available in 375 ml glass bottles, or in 330 ml high grade PET bottles. Compared to other bottled water brands, The still variety of Voss Water has extremely low total dissolved solid (TDS) levels. TDS can be defined as the mineral level found in bottled waters. The sparkling Voss Water, on the other hand, is known for its crisp and refreshing taste that is why it is said to complement fine food and even wine. Same with the still variety, Voss Sparkling also has a low TDS level compared to other bottled natural sparkling water brands. Voss Water comes from an artesian source which can be found in the unspoiled wilderness of Southern Norway. The water is generated from an artesian well which is deep beneath the ground. The source is an underground aquifer that is under layers of sand and gravel. The water is filtered naturally and is protected from pollutants and contaminants. Since the water is unprocessed, it retains its fresh and clean taste. Voss also believes that quality should always come first, that is why they make sure that Voss Water meets all bottled water standards for quality and safety. The company has scientists and independent certified laboratories which conduct extensive tests on the source of the water and the bottled water products to be consistent in exceeding or complying with all requirements set by the state and by the Food and Drug Administration. Voss Still Water has sodium, calcium, magnesium, chloride, fluoride, and sulfate contents. It has a pH level of 6 and a TDS level of 44. Voss Sparkling has the same contents, but has a pH level of 6 and a TDS level of 290. In 2016, Voss also added two new products to their sparkling water line-up. They introduced Lemon Cucumber and Tangerine Lemongrass flavored sparkling water, which is available in a 375 ml glass bottle. The new products are all natural, unsweetened and has zero calories, so consumers can enjoy them without the guilt.